The medium-term challenge is the infrastructure program, particularly foreign investment which supports investment growth – and which has taken off dramatically in the Duterte era. Self-induced policy mistakes play a role in higher-than-expected inflation. The IMF attributes more than half of Philippine inflation to price increases in food, beverages and tobacco, particularly rice. The National Food Authority administrator resigned a month ago after failures to purchase enough rice grains from local farms to stave off the need to import. The IMF supports the Philippine policymakers’ plan to replace the rice import quota system with one based on tariffs, while stressing the need to support small farmers affected by the reform. As monetary policy has been accommodative, inflation has been driven by adjustments in excise taxes, rising oil prices, the weaker peso, and above-trend growth. That’s why Bangko Sentral raised its benchmark interest by half a percentage point last week. Inflation remains the top concern of Filipinos, as evidenced by the recent Pulse Asia survey. The effort to curb inflation must remain elevated, however, because inflation may remain a challenge in the foreseeable future. First, while real GDP growth is projected at almost 7% over the medium term, inflation has also been projected at above the 4% upper target bound in 2018 and around 3−4% during 2019–20. Recent monthly figures exceeded the target bound by margin that’s too wide. Second, in normal times, mild discrepancies could be tolerated. But these are no normal times, as evidenced by the Fed’s rate hikes, strengthening dollar and escalating trade wars. That’s also why Philippines is not alone in this battle. In my last column, I showed how the U.S. rate hikes and the dollar have penalized emerging Asian currencies causing significant damage in Asia’s most rapidly-growing economies, including India, Indonesia and the Philippines. That’s why Indonesia’s central bank raised its policy rate to 5.75% last Thursday. The Bangko Sentral has raised rates by 150 basis points since May, which is its most aggressive tightening since 2000. Indonesia’s rate hikes this year also amount to 1.50 percentage points. India's central bank has already raised its rate to 6.5% and is expected to hike ratesates for the third time in October. Following surpluses before 2016, the current account deficit widened to 0.8% of GDP in 2017, driven mainly by imports of capital goods, oil and raw materials, reflecting strong investment growth. According to the IMF, the Philippine current account deficit is projected to remain manageable. In this view, Philippine output would stay above potential in 2018-20, even though the current account deficit may widen to 1.5% of GDP in 2018 driven by a continued rise of capital goods imports, mostly financed by foreign direct investment (FDI). 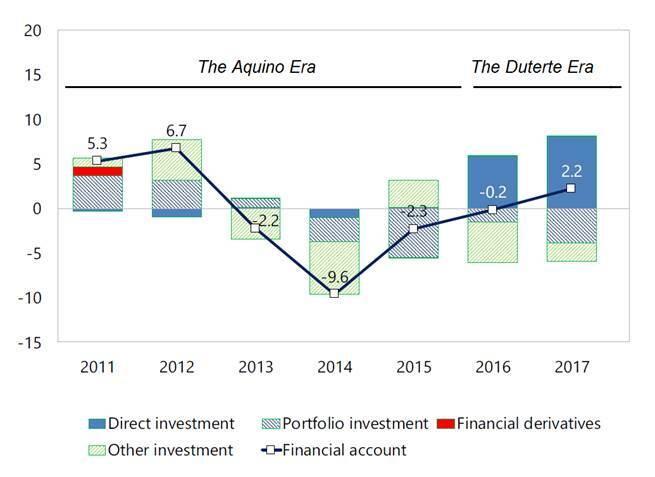 Here’s the difference between the Aquino and Duterte governments: In the Aquino era, early optimism and promises to change the FDI legislation paced an increase of capital flows in the early 2010s. But these flows represented mainly portfolio and other investments, not foreign investment. Eventually, these capital inflows reversed into significant outflows. In the Duterte era, early optimism and promises to bring in more FDI have paced a dramatic increase of capital flows, which could be sustained until early 2020s (Figure). True, the current account balance declined in 2017, as the critics complain, but it did so mainly due to higher investment, which reflects Philippines attractiveness as an investment destination, and higher oil prices, which are not under the control of domestic policymakers. Moreover, last year FDI inflows more than offset the outflows in portfolio and other investment. It is also true that international reserves have declined in the Duterte era. However, Philippine reserves remain higher than in most emerging economies worldwide - and significantly higher than in India and Indonesia which cope with similar challenges. That’s precisely why the overwhelming majority of Filipinos oppose any effort at a destabilization of the Duterte government. That’s why they stand behind its economic program and the war against drugs and corruption. They want no return to the past. They want the economic future that has eluded them far too long.